I’m playing catch up with this post, since Aoife and I missed the first class with St. Mary’s (it was my birthday!). Theresia kindly offered to cover for us and help Astrid to introduce the class to our project. Meet Nightowl, guardian of the night! Friday was the very last day of our classroom visits with the local primary schools. Setting out that morning we could hardly believe that we would be spending our next week like we’ve done for the last while by helping kids make some really cool characters to decorate the town for our festival and shoot some great picture stories to share with the world. 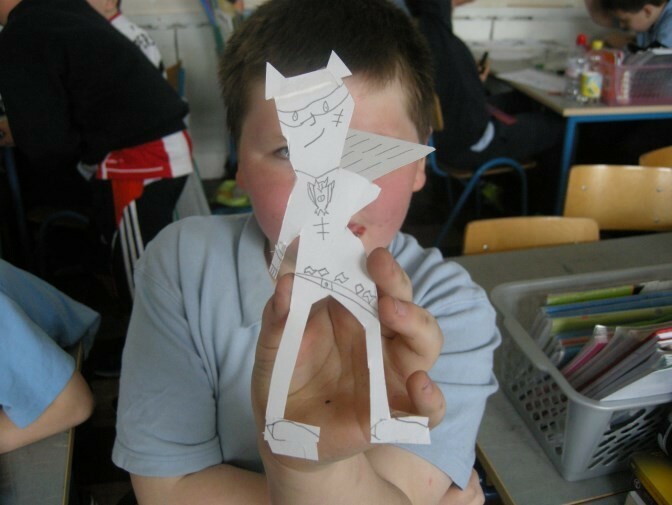 Our first two class with the Gaelscoil taught us though that we in for some serious fun, last day or not. The kids gave us their usual warm welcome (by name and all) and were happy to get their characters back. 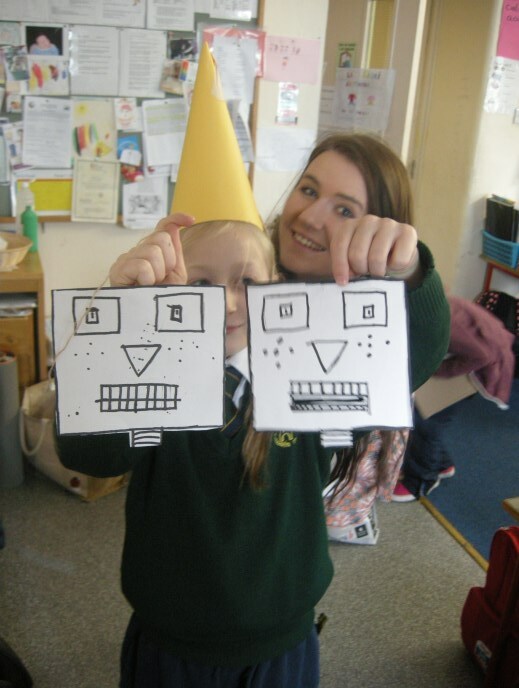 Aoife pops her head into the picture with Hazel her new robot head character. After our final class with Ballyneale we made our way out to Powerstown to shoot all of their stories and get them ready to upload to the Junction website. On the way I popped home to grab a basket-load of anything I had lying around that might serve as props or set pieces. Once in Powerstown we reunited each group with their characters and refreshed our memories of each group’s storyboards. Before anything could go online there’d have to be some hard work by this dedicated gang of students to get their stories ironed out and final adjustments to their characters made. 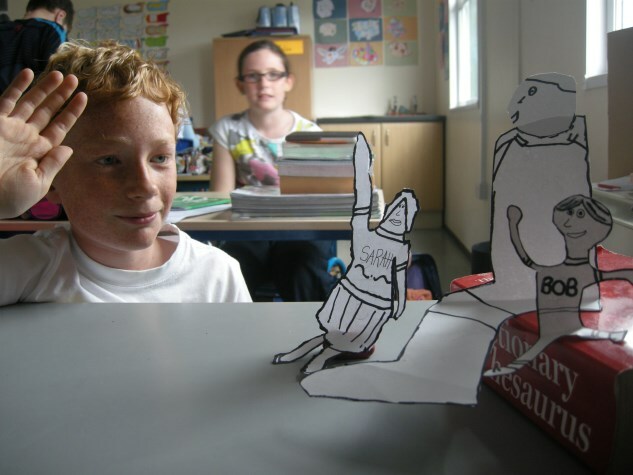 Say hello to these pop-up people and the deceptively calm opening scene of a very dramatic story! 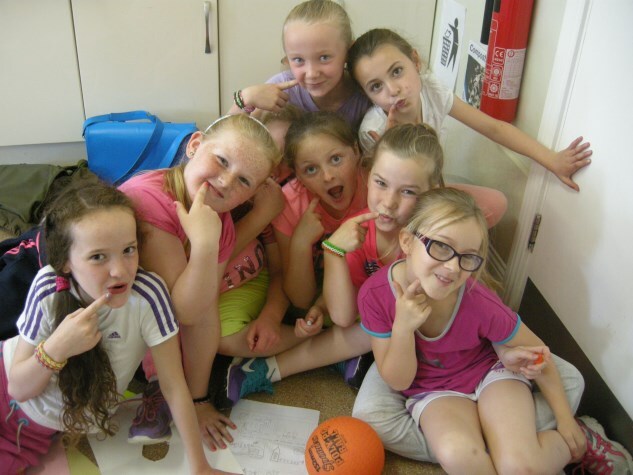 Last Thursday was our final class out in Ballyneale and while that may be sad, as usual the kids blew us away with their creativity and enthusiasm in crafting stories, making characters and building whole little worlds with improvised props. It wasn’t just the kids who impressed us though – every class we’ve helped teach here we were pleased to work with the principal Michael McHale (who also teaches 3rd and 4th class). What a teacher! 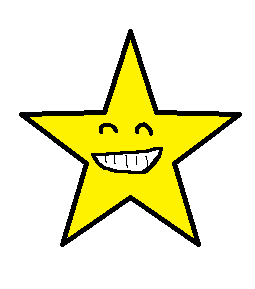 Here’s a gold star for the kids (and teachers) at Ballyneale. The kids really seem to love him and his approach to motivating them worked wonders – all it took was to keep telling the kids a good-natured fib that we’ve been hearing Ballyneale is one of the best primary school in the area and that it also has the most creative, hard-working and helpful students around. He did it all with a daycent helping of humour that manages to make just about every part of the class fun (even for us visitors). These girls certainly look like they’re having lots of fun. And sure enough, by the end of the third class his ‘fib’ came true. These kids proved it’s possible to be well-behaved, funny and playful all at the same time. “But this isn’t a blog about manners, it’s about art!” I hear you say. 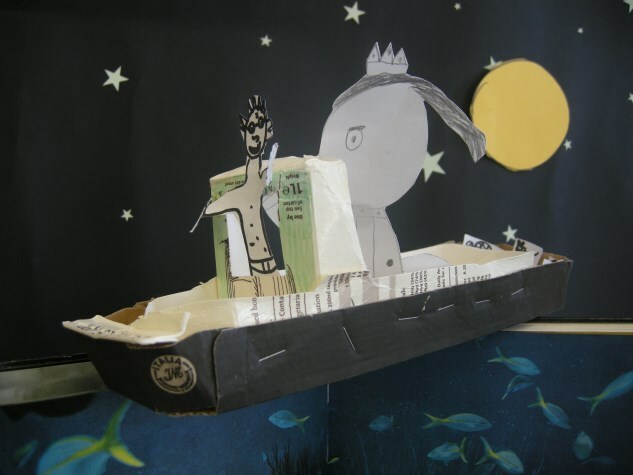 Have no fear: the kids at Ballyneale are brilliant storytellers and artists too. We loved seeing their stories come together, especially with the beautiful sets they built using the different coloured sheets of card that I brought it and whatever else they found around the classroom, from Jenga sets to marbles and potted plants. 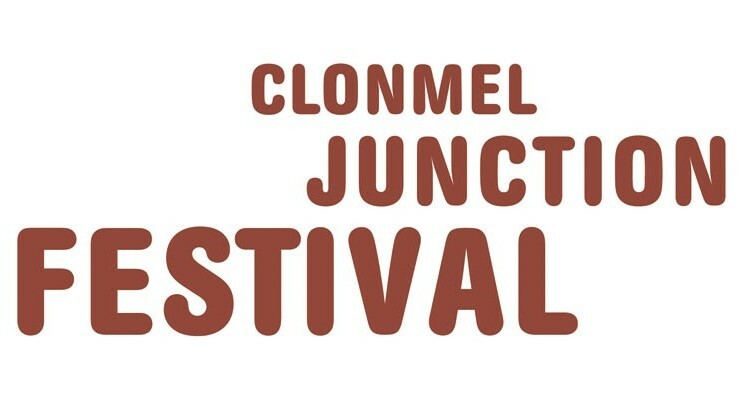 Well, what can you expect when their stories are uploaded to the Junction Festival site next week? A breath-taking scene from “Exploring the Sea”. 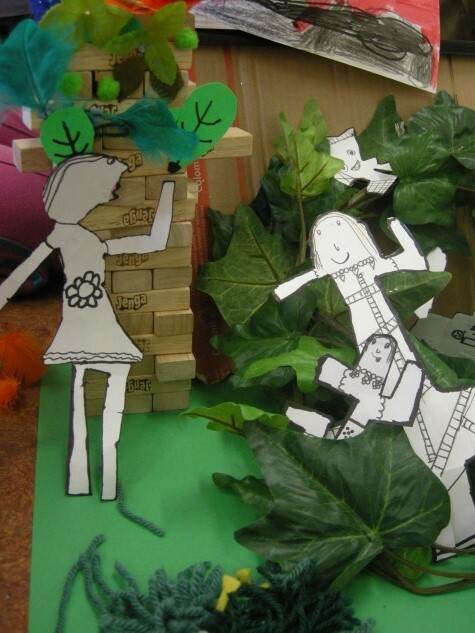 What will these explorers find in the deepest parts of the jungle? …and even more space-bound derring-do, from a rescue mission to the moon to a thrilling battle to defend the mighty ‘Space Wall’. (Yes, these kids love space). Not to worry if space isn’t your cup of tea though, there’ll be lots more to see! As for our last class – it ended with a round of applause for us and as usual, all of the kids wanted to be picked to help us carry our things out to the car. We walked out with a whole gang of helpers carrying our things. Bye bye Ballyneale, it’s been great! Tuesday morning Aoife and I met Astrid at Ardfinnan N.S. and made our way inside, only to find out that were early, which admittedly is a rare occurrence since we’re usually just a tiny bit late. 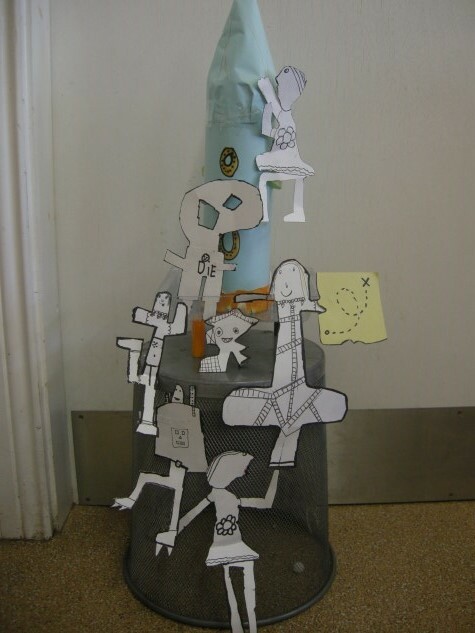 We just had to fight the stereotype of the wacky scatterbrained artist. 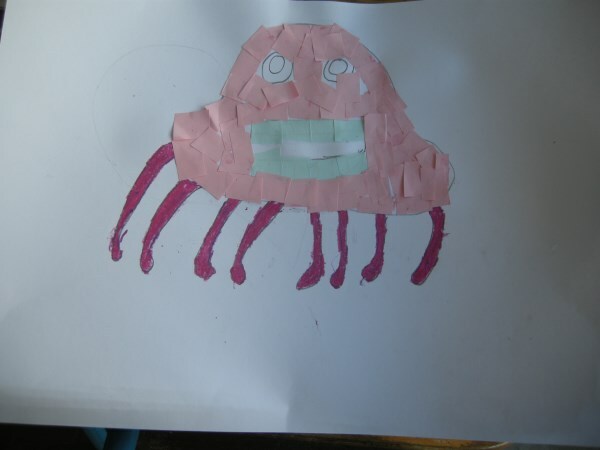 The kids weren’t even in the classroom yet but we did see these amazing collages of sea creatures the kids had done in art during the previous week on their desks. We were very impressed with them. Fair play! 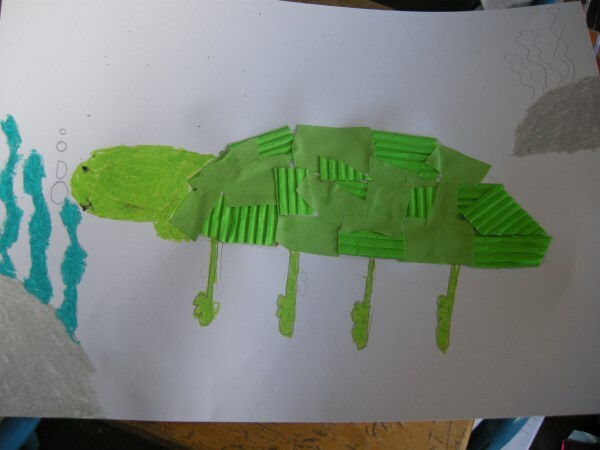 Like this bright green sea turtle with a brilliantly textured shell. And this beautiful creature by Hannah Rose. I thought it was a jellyfish at first, but Hannah said it’s an octopus. And sure enough, it’s got eight arms!